IFA 2014: Philips to serve up 4K TV content from a little black box | What Hi-Fi? 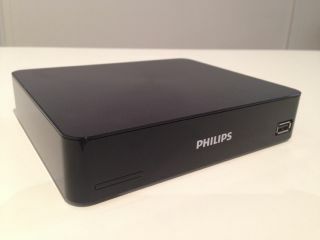 The new UHD 880 is a compact device that will stream 4K content to all 2013 and 2014 Philips ultra high-def TVs. With admirable (if questionable) understatement, Philips has announced its UHD 880 Media Player at IFA 2014 in Berlin. This unassuming little box will allow receipt and playback of HEVC encoded content over the internet, solving what is one of the current 4K TV era's most pressing problems. Android L-based and expected to retail for around €250 when it goes on sale early next year, the UHD 880 is compatible with all of this and last year's Philips 4K TVs. Customers who buy a Philips 8809, 8909 curved, 9109 or 9809 TV this year can expect to receive their UHD 880 free of charge. HEVC is an encoding and compression standard already in use by the majority of the world's online video providers to stream 4K content to their customers. The UHD 880 will be able to receive HEVC-encoded videos via wi-fi, ethernet or USB. Connection to a TV is via HDMI 2.0 at a maximum of 60 frames per second (except for the 7809 and Argos-exclusive 6809 4K models, which top out at 30 frames per second).